"Oskar, even in bad times, people can be good. You have to look for the blessings." Oskar arrives in NYC on the seventh night of Hanukkah, which also happens to be Christmas Eve. It's a cold, snowy December night and Oskar, who arrived penniless, with only an address and a photo of his aunt, has a long walk up Broadway from the Battery to her house on West 103rd Street before sundown and the lighting of the Hanukkah candles. Along the way, Oskar finds the blessings his father told him to look for. Watching an old woman outside Trinity Church feeding pigeons, he eats the bread she hands him to feed the birds. Seeing him so cold, tired and hungry, she gives him a small loaf of bread to eat. At a Union Square newsstand, the news dealer gives Oskar the Superman comic he can't pay for but is attracted to. Later, Oskar has his first "conversation" in America, whistling back and forth with Count Basie outside Carnegie Hall. Encountering some boys playing in the snow in Central Park, Oskar offers a helping hand to a boy who has slipped. 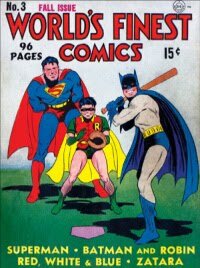 Seeing Oskar's frozen hands, the boy gives Oskar his warm mittens and in return, Oskar gives him his Superman comic. Altogether, Oskar experiences eight blessings (one for each night of Hanukkah) as he journeys up Broadway to 103rd Street. But, of course, the last and most important blessing is finding his aunt. The Simon's text is sparse but lyrical, a perfect read aloud book, and the story is carried forward wonderfully by Mark Siegel's paneled illustrations, done in a variety of sizes. Siegel has rendered the illustrations in greys and earth tones, with splashes of color, so that they convey the overcast cold, snowy day of Oskar's arrival. He has captured the variety of emotions that Oskar experiences on his long walk - fear, hope, confusion, wonder, surprise, happiness - both in Oksar's demeanor and his facial expression, and sometimes his emotion is only reflected in his eyes. 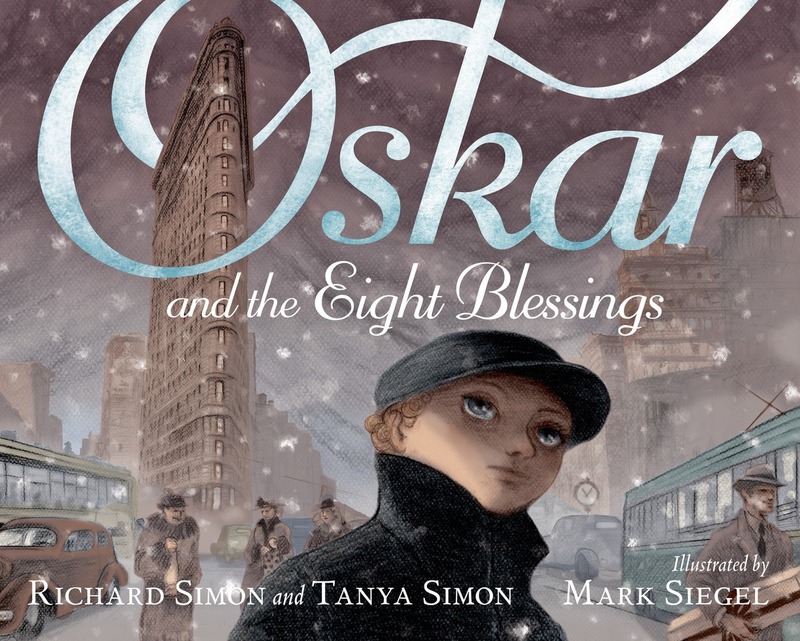 Oskar and the Eight Blessings works on so many different levels, but mostly it is a beautiful, sensitive Hanukkah story that really demonstrates that it is a season of hope and miracles. The fact that the seventh night of Hanukkah is Christmas Eve, also a season of hope and miracles, only adds to the ambiance of the blessings. But Oskar and the Eight Blessings is also a gentle way to begin introducing the Holocaust to young readers by explaining to them what happened on Kristalnacht and why Oskar was sent away by his parents to safety can provide enough information to help with those more difficult discussions later on. NYC can be a daunting place even today, and I can only imagine what it would have felt like to this young Jewish refugee in 1938, escaping the cruelty of the Nazis who had already been in power since 1933, having no money and not speaking English and looking for an aunt who not only doesn't know him but isn't even expecting him. But New York can also be magical, especially during the holidays, a place where blessings actually can happen. Be sure to look at the map of Manhattan to see the places where Oskar's received his blessings in his new world and read the Author's Note for some very interesting background to Oskar and the Eight Blessings.